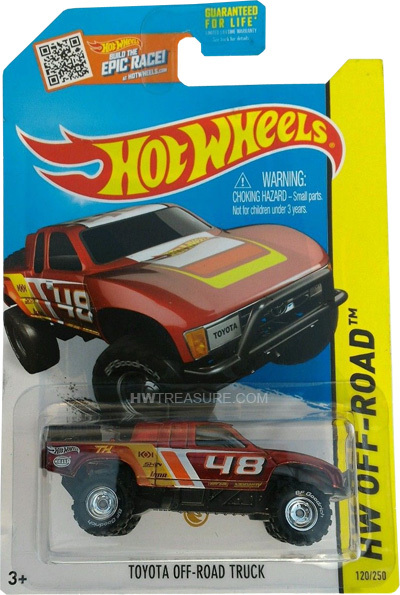 120/250 is part of the HW Off-Road series and the 2015 Super Treasure Hunt set. The Spectraflame red truck sports “48” on the white roof. The hood and sides have white, orange, and yellow graphics as well as the Hot Wheels logo. The sides also have “TH”, “48”, the Hella logo, and a variety of other logos. It has clear windows, a black interior, Real Rider Deep Dish wheels with BF Goodrich off-road tires, and a black Malaysia base. 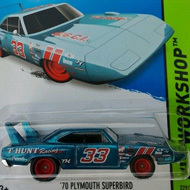 This vehicle can be found in mix “Q” of 2015 Hot Wheels mainline cases. The truck made its debut in 2000 in the Xtreme Trucks 2 Car Set. It is based upon a Toyota T100 that has been converted into an off-road racing truck.